“Break, Break, Break” was published in Tennyson’s two -volume edition of Poems in 1842. The lyric references Tennyson’s close friend Arthur Henry Hellam who died of stroke at the age of twenty-two. Although the poem was originally written on 15th October 1834, seven months after Hallam’s death, it was published eight years later in the second volume of Poems. Many readers conceive that Tennyson wrote the poem in Clevedon, a popular seaside resort in Victorian England; however, according to an autobiographical fragment, Tennyson wrote it “in a Lincolnshire lane at five o’clock in the morning” where he resided (Tennyson 198). Despite the poor reception of Tennyson’s Poems (1842) in the earlier years of its publication, “Break, Break, Break” enjoyed tremendous popularity, especially in the second half of the nineteenth century when it was reprinted in anthologies, and school books, and set to music by over thirty five British and American composers. As already mentioned, the poor reception of the Poems at the time of the publication and in the succeeding years can be traced by looking at the circulation figures. According to Wise’s A Bibliography of Tennyson, the 1842 edition sold eight hundred copies within a year. The second edition published in 1843 took two years to reach one thousand copies and in the middle of June, 1845, a third edition appeared. The sales for are not recorded, but the number is presumably larger than the previous editions. in July 1846, upon having a conversation with Tennyson’s publisher Moxon, Browning noted in his letter to Elizabeth Barrett that Moxon sold fifteen hundred copies of Tennyson’s poems within a year and was preparing for a fourth edition (Lounsbury 501). 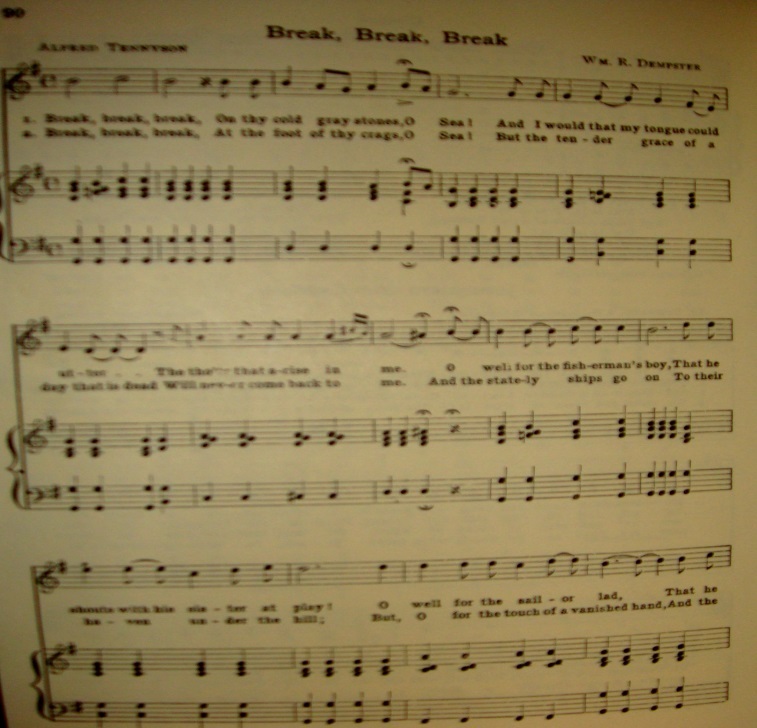 “Break, Break, Break,” however, gained popularity outside the boundaries of its volume and reached wider audience of scholars and common readers. That said, in the second volume of Open Sesame: Poetry and Prose for School Days (1890), the poem occupies a significant place among the poems of Browning, Campbell, Hemans, Wordsworth and other prominent poets. It was intended mainly for school use and adopted for ten to fourteen year old children. The very next year attested the publication of Tennyson for the Young (1891), whose content includes Tennyson’s “Break, Break, Break” aimed at young readers. Likewise, The Teaching of Tennyson published in 1894, was reprinted five times within four years and based on the preface; the book was intended and aimed at students as an introductory study (Oates 9). Most importantly, the poem was anthologized in Gosse’s, Victorians songs, lyrics of the affections and nature and Stedman’s, A Victorian Anthology, both published in 1895. A few years later, the poem found its place in Alexander’s An Anthology of English Poetry for Schools published in 1901 which serves as an indication of the poem’s continuing popularity in the twentieth century. Lounsbury, Thomas R. The Life and Times of Tennyson: From 1809-1850. New Haven: Yale University Press. 1915. Print. Oates, John. The Teaching of Tennyson. London: James Bowden. 1898. Print. Tennyson, Hallam. Alfred Lord Tennyson: A Memoir by his Son. New York: MacMillan. 1897. Print. Wise, Thomas J. A Bibliography of the Writings of Alfred Lord Tennyson. London: The Dawson of Pall Mall.1967. Print.